Big Band Jazz in the Post-Swing manner of Count Basie, Woody Herman and Stan Kenton. Per usual we're pushing mostly big band jazz mostly in the post-bop mainstream manner. Here are a couple more of Holman's splendid works, a couple of beauties by Thad Jones, and some jewels from the Basie book - two of which are thanks to John Vermeuen's very keen ear! We're pleased to be adding Slide Hampton's distinctive writing to the mix as well as a beautiful bossa nova by Alan Broadbent and a savory exotic dish from Phil Wilson that's an unforgettable ride. For us, this issue tops off with Bill Evans' "Turn Out The Stars," an eloquent eulogy to Evans' father. This exquisite arrangement was written by Bill Dobbins for tenorman Bryan Olsheski and we know you'll agree that its beauty is beyond description. 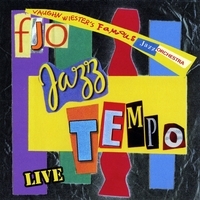 For your enjoyment we tender all of the above in JAZZ TEMPO.